Brandon was a victim of one of the most hideous forms of animal cruelty in modern animal agriculture: Foie gras production. 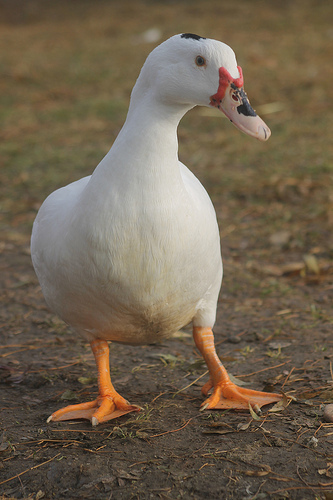 Fortunately, he was among a group of rescued foie gras ducks who found their way to sanctuary at Harvest Home in 2011. In the first few weeks at the sanctuary, Brandon was frightened by humans and other animals. As time moved forward, he adjusted pleasantly to his new peaceful surroundings. But Brandon’s new beginning at the sanctuary was hit by an unexpected blow. Suffering from poor leg health, Brandon began to lose the ability to walk, which is an unfortunate sign of breeding birds for profit-given rapid growth and heftiness, not longevity. It wasn’t long before Brandon could not walk at all. Our avian vet diagnosed Brandon’s leg condition as osteoarthritis. Further, our vet thought he would not regain any movement in his leg and would need to be euthanized soon. We were devastated by this news. With all Brandon had been through, we are not ready to give up. Instead, we developed a hopeful plan for rehabilitation. We nicknamed Brandon’s rehab regime “Operation: Walk for Life”, which included daily doses of pain medications, hydro-therapy and lots of green salads. In the first weeks of rehab, Brandon’s mobility improved marginally. But, we were focused on the small improvements. Approximately two months in to “Operation: Walk for Life”, Brandon was walking again. He proved the doctors wrong. It was amazing to watch a miracle unfold. Further, Brandon actually started to enjoy human companionship. Fro the moment he arrived at Harvest Home Animal Sanctuary, Brandon enjoyed life more than any duck we know. He foraged on pasture, napped on piles of leaves and found comfort living with the fourteen lady ducks of the sanctuary. “Operation: Walk for Life” was a true success.